The Crawford Recliner Loveseat gives you tons of room to sit back and binge watch your favorite shows. You can lay all the way back or sit with your feet up. 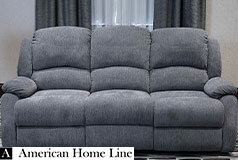 It’s upholstered in a grey polyester chenille fabric that makes it ideal for homes with kids and pets. 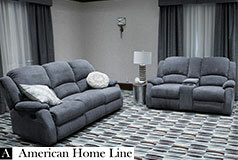 The fabric is durable and soft. 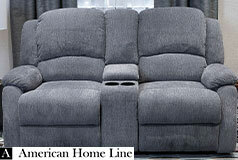 The two-seater recliner features a built-in centre console and two drink holders. The centre console gives you plenty of room to store your favorite book and remote controls. 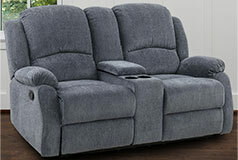 Key Features: The reclining loveseat lets you recline in the position that’s most comfortable for you by using the manual latch located on the side of the loveseat. It features a storage console and two-drink holders.